Hyderabad : Rationalist Voice Publications : Pratulaku, Viśālāndhra Buk Haus, 2005. 432 p. ; 23 cm. Satyaṃ musugulō sarvaṃ abaddhaṃ : mataṃ bānisatvaṃlō pillalu / Nariseṭṭi Innayya. Serialised in Vaartha Telugu Daily with few cartoons. Lucid narration of the adventurous life events of great fighter of ideas in international arena.illustrated with photos starting from early days till death.different phases explained in the context. He started as National Terrorist against British Rule in India, travelled widely in East and West, landed in USA , married Evelyn Trent ( Standford university ), Met Lala Laj Pat Rai in New York, escaped to Mexico, started communist party-first of its kinds outside Russia, attracted the attention of Lenin, participated in World Communist Movement along with Evelyn, Edited couple of journals, started exile communist party in Tashkent, arrested in India in 1931, jailed for 6 years, produced volumes of literature on Philosophy, after release started Radical Democratic Party, abondoned the party to start Movement and ended as great Humanist. As chairman of the committee on child Abuse by Religions on behalf of International Humanist and Ethical Union, London, moved the resolution for saving children from religious abuse. This resolution was adopted and sent to UNESCO. This booklet explains why children should not be abused mentally which is going in all religions in all countries. Various incidents in the world and alternative protective measures are indicated. Alternative medical systems are abusing the patients with attractive slogans without any scientific evidence, otest and proof. The patients rights are denied. Governments are also blindly supporting some of the alternative systems in some countries. Homeopathy, Nature Care, Acupuncture, Magnetic Therapy and other systems were analysed briefly. Unless the scientific proof is shown no alternative medicine should be allowed. Exposed the popular beliefs about persons and events. Mahatma Gandhi, Viveknanada are typical examples in this realm. Myths in Psychotherapy based on Thomas Szasz explained. Superstitions were explained. This was published by Telugu Academy, Hyderabad,India. Terrorists in various countries were explained with details until early 1970s.this includes naxalites in India. Most popular persons like Lenin, Mao ,Hitler and others were taken as typical examples of enemies of mankind and given details how they killed, tortured people. This is explanation why renaissance could establish roots in India despite British rule. How various reform movements like Brahmo , Arya Samaj were defeated. Vedanta movements of Vivekananda gained upper hand with populistic slogans. Various political movements also failed to uplift the masses towards Renaissance. Need for renaissance stressed after revealing the wrong paths of Gandhi and others. This Journalist who truned humanist late in life lectured and produced several writings ,pleaded for humanism ffor India. He was editor of two telugu dailies and member of Rajya Sabha, toured world and lover of arts and literature. This book was microfilmed by the LIBRARY of Congress, Washington D.C.,It indicates the importancae of the subject. Caste Politics in British India and post independence India were explained in Andhra Pradesh State. Similar situations were prevalent in Indian states too. Andhra Pradesh was ruled by Congress party since Independence. Congress symbolised Khadi dress for National outlook and Patriotism. Suddenly Cine hero came into field and changed the whole atmosphere, captured power in nine months. He wore Saffron dress and indicated his way of approach to Politics, pleaded for pure simple way of life in public field.This happened in 1982 in Andhra Pradesh, India. These incidents were narrated with details. This Telugu Academy publication was meant as text book for graduate students . It narrates the politics, parties and administration in andhra Pradesh state covering nearly 100 years commencing from late 19th century till mid 20th century in the state. All political parties try to capture power by any means. All political leaders either defected parties or encouraged defections to go into power. No ethics were observed. This attitude of different political parties-left ,right, center are curious factor and explained in detail how they behave. Typical history of Andhra Pradesh political developments were taken as example. Published by Telugu Vidyarthi, Machilipatam, Andhra Pradesh India in early 1970s.This book is lucid narration of the history of Marx and Marxism aimed at students and general public. Dialectical materialism and other marxian concepts were explained in simple language. This controversial and provocative booklet exposed the communists and their insincere attitude towards their Guru Marx. Early humanist writings of Marx were deliberately concealed by official communist parties in Soviet Union. Some crucial life events of Marx were also kept secret from public. Marx had illegal sexual connections with his servant maid and had one son through her, but disowned her. Engels saved her. This booklet was serialised in Andhra Jyothi telugu daily and evoked much discussion. Ram Mohan Roy stood for Renaissance in India during British Regime. But some religious reform movements worked for reforms.Vivekananda came and upset the renaissance movement and set the cloak back. Political parties and movements, religious sects worked in different directions.In the pre independence days Gandhi, Subhas chandra Bose, Ambedkar,Nehru and Hindu religious parties worked. Again M.N.Roy emerged during 1940s with a plea for renaissance for India.These trends were briefly discussed in this book. It was published by Telugu Vidyarthi Publishers, Machilipatam, Andhra Pradesh in early 1970s. It is text book for graduate students introducing sociological concepts and trends of leaders. It was published by Telugu academy,Hyderabad,India. It is text book meant for graduate students. Philosophical concepts, Ontology,Cosmology and Epistemology were discussed in this book.it was published by Telugu Academy,Hyderabad,India. This book discussed how political parties split into various Splinter Organisations in due course,and fight for personal leadership and dominance. These splits have become the order of the day. All political parties suffered with this trend. This is the first book of the author on Andhra Pradesh politics. It was brief but touched the essential points of trends in the state including the fight for seperate state. It was published by Navajyothi Books,Vijayawada,India. Jointly written along with Professor Mamidipudi Venkatarangaiah. It was prescribed for service commission examination going students in the state. This book covers the freedom struggle in the state from early 20th century till the Independence.It was published by the cultural wing of the state government. This book was published by State Book Club, Hyderabad. It deals with all political parties that came into exitence before and after independence in the state. Some parties died in course of time. Articles on late AGK(Avula Gopalakrishna Murthy) were published. A lengthy preface was written by me bringing out the personality of the great Humanist AGK.It was published by Telugu Vidyarthi,Machilipatnam,India in 1966. Articles,Prefaces of AGK Murthy were compiled and edited. A brief introduction by me was written. it was published by Telugu Vidyarthi,Machilipatnam,Andhra Pradesh,India in 1967. Editor of Telugu Swatantra, Andhra Bhoomi Daily. Articles on him by various writers were edited and published with my long preface. 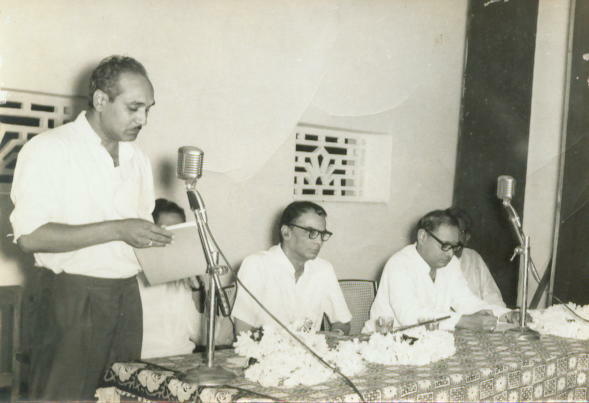 The souvenir was released in a function at Kurnool in 1968.